We know you have a job to do. And we want to make it easier. First of all, we listen closely to you. We visit the job site whenever possible, and with an artist’s eye we consider the space, light, any existing elements, and the client’s functional needs. With our experience as glass artists, we can anticipate design and installation challenges, and present alternative strategies when needed. And as an industry veteran, Fox Glassworks is sensitive to construction schedules and budgets. We offer the widest selection of fully saturated colors in the region and are among the few glass artists in the Northwest that provide one-piece bullnose glass tile and a satin finish. We’re dedicated to reducing our business’ carbon footprint. Our suppliers, who share this dedication, are located in the Northwest, which keeps our shipping—and delivery times—to a minimum. We also make your life easier by making tile and other pieces by hand to fit your project, not the other way around. All of our work is site-specific, and seamlessly blends with the space around it. Our convenient location in central Oregon means we can easily talk and meet with you, show you some possibilities, and quickly get our products into your hands. Fox Glassworks partners with interior designers, architects, builders, remodelers, and homeowners in the Northwest who demand the best glass tile and glass design for residential and commercial projects. 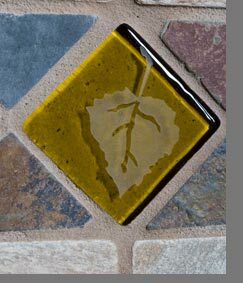 All of our tile is made by hand at our studio in Bend, Oregon.